I’ve been reading Stephanie Pearl-McPhee’s book Free Range Knitter recently. Stephanie is popularly know as The Yarn Harlot and has written a number of books about knitting. These are not how-to books; they are books about a knitter and her relationships, with her knitting, with her family and friends, with other knitters, with <gasp> non-knitters, and with the world in general. The Yarn Harlot’s books are very, very, very funny. Make-you-laugh-out-loud funny. Make-you-laugh-till-tears-run-down-your-face funny. Kind of like Dave Barry books, only better because they are about knitting. And they are also, at moments, very touching, without being overly sentimental or hokey. The Yarn Harlot’s books are very popular among knitters, but not just because they are funny and entertaining. They are so popular mostly because, well, Stephanie gets it. She knows how joyous and frustrating and pleasurable and exasperating and addictive and soothing knitting is. She understands exactly how I feel when someone sees me knitting socks and asks me why I would waste my time knitting socks when I can buy socks at Wal-Mart for a dollar a pair. 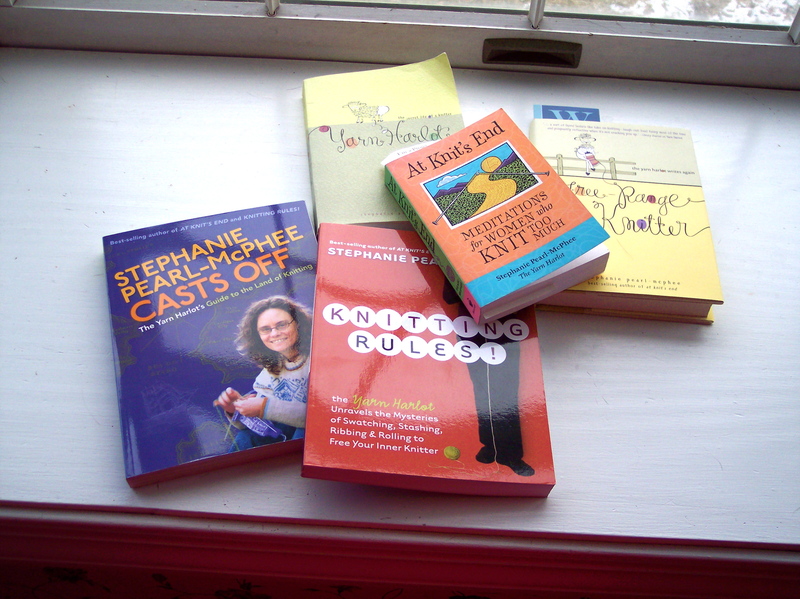 Sometimes when reading one of Stephanie’s books, I want to shout to her, “Get out of my brain!” She understands why the sister who was given a pair of hand-knit socks for Christmas and said, “Oh, these socks are lovely, but I already have enough hand-knit socks and I’d really prefer a pair of mittens,” will never, ever in a million years get another pair of hand-knit socks from me, but the cousin who said, “I can never have too many pairs of hand-knit socks,” will continue to receive occasional packages in the mail. She knows what it is like to discover that the heavily patterned sweater knitted in that itty-bitty gauge or that intricate lace shawl knitted in cobweb yarn with patterning every single row has a glaring error near the very beginning that requires either ripping out or great ingenuity to correct. She understands why we knitters buy more yarn than we can possibly knit up in our lifetime (S.A.B.L.E.—stash Enhancement Beyond Life Expectancy), why we are reluctant to actually knit some of the yarn in our stash (because it’s too nice or too expensive, because it is a souvenir from a trip or a present from someone special, because it’s too ugly for words, because…), why we often have a lot of different projects going at one time. Yes, Stephanie Pearl-McPhee is Everyknitter.